To make a booking or for further information please contact Alison Gray directly at alisonw.gray@virgin.net or 07908 208 466. Only two places left. Come along and create your own set of tiles to a design of your choice, learning how to manipulate clay, create a mould, press and finally decorate your tiles. The final tiles could be used as a sink spashback, a trivet or base for a tray. Week 1: Monday 11th February, 6.30pm – 9.00pm After an introduction to our Studio I will show examples of traditional and contemporary tiles. We will then experiment using texture, incising and adding clay to create an image on your tile prior to creaing a mould. Week 2: Monday 18th February, 6.30pm – 9.30pm This session will involve creating a plaster mould of your tile. this will be done on a one to one basis, giving you an undertanding of the mould making process so that in week three you can produce multiple replicas of your design. 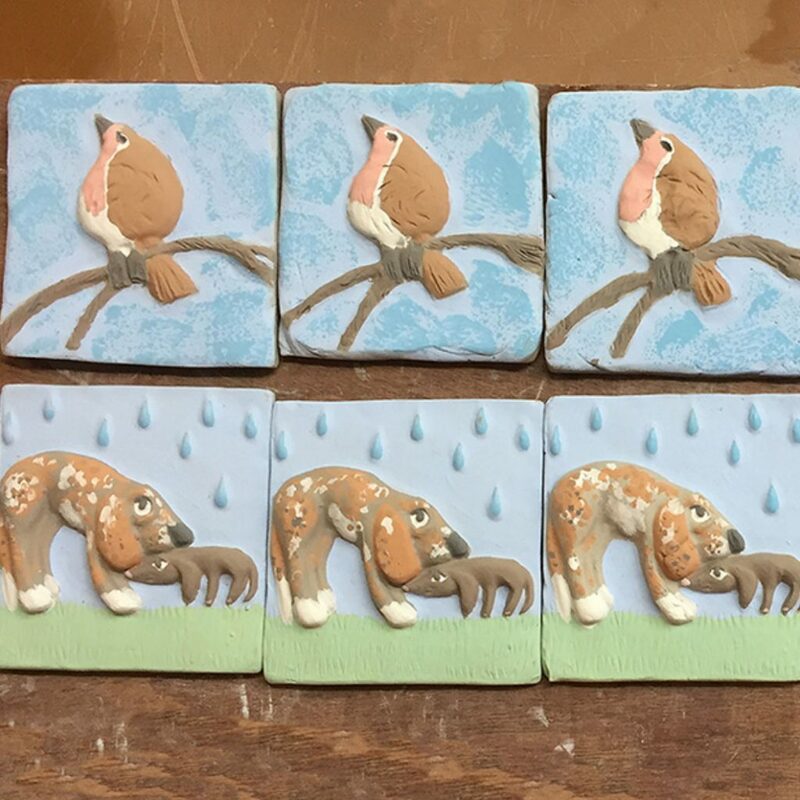 Week 3: monday 25th February, 6.30pm – 8.30pm With your plaster mould dry you can now create a set of identical tiles. These will then be partially dried ready for decorating next week. Week 4: Monday 4th March, 6.30pm – 8.30pm After a demonstration of applying colour to your tiles you can spend the evening decorating your tiles in your own style. After this I will start the drying and firing process and your finished tiles will be ready for collection at a later date. The cost of the 4 evening sessions is £100.00. Price includes clay, glaze, plaster and two kiln firings. Space is limited to just 10 places, please book in advance. I encourage you to bring along your own designs, and materials for inspiration, or alternatively just have fun and experiment on the night!